This project manager job description is a great way to make sure that all employees know what is required of them during work hours. Direct project from start to finish. Develop plans and detail scope of project. Communicate expectations and plans to team members. Monitor project milestones and deadlines. Develop and build business relationships. 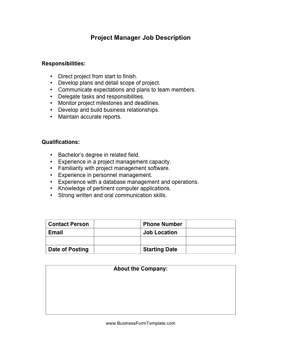 Experience in a project management capacity. Familiarity with project management software. Experience with a database management and operations. Knowledge of pertinent computer applications.